Theresa May has always had a difficult hand to play, and she has just used up the last card, offering MPs a final bargain: "Back my deal, and I'll quit." In the big picture of Brexit it was always an option that in the end, the prime minister might offer up her own position as leverage for support in return. But big political moments are still a surprise when they come. Before the announcement, one of her senior colleagues told me he didn't know what she was going to do - she was tucked away somewhere in the House of Commons with her chief of staff working out her options. Another minister said they had "no idea". A senior Brexiteer, who is resolved to oppose her deal told me, frustratedly, they thought that the PM wouldn't say anything new, it would just be more vague assurances. Remember, of course, Theresa May has only survived this far because she promised to quit before the next scheduled general election. But just before 5pm this afternoon, the Commons chamber emptied of Conservative MPs, who made the short journey up the stone stairs to Committee Room 14, to pack in to hear what she had to say, as she spoke from a prepared text. 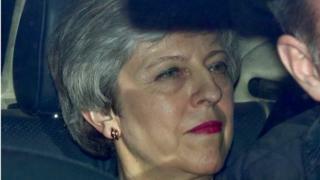 The hope in Number 10 is that her offer to depart will entice dozens of Tory backbenchers to back her deal, which ministers want to bring back to Parliament in the next 48 hours. The deal has been kicked out of the Commons twice, resoundingly, and her departure doesn't change a word of it. So if it shifts votes, that might sound nuts - if the Brexiteers hate the deal, surely, they still hate the deal? True to a point, but politics is a strange business, with rivalries and ambition part of many MPs' calculations. And remember too that the controversy over the prime minister's deal has mainly centred on the first phase of Brexit, the "divorce deal". The political declaration - the route map for the phase that will settle the longer-term relationship between the EU and the UK - is important, but extremely vague. So for many Tory MPs, a reassurance that it won't be Theresa May who leads that next phase is important. The signs already are that many MPs will switch from opposing to backing the PM's deal. Brexiteers are meeting now to discuss the strategy they want to take. Some big names, like Boris Johnson, Iain Duncan Smith and Jacob Rees-Mogg, are now coming into line for the deal. But the resistance could still be fierce - and even this sacrifice from Theresa May might not be enough. The scale of dislike for the deal was greater than Number 10 had foreseen when it was struck. That means the scale of the political move required is enormous too. Image caption But will Speaker Bercow allow the vote to take place? And we still don't know if the Speaker, John Bercow, will even allow the vote to take place. What we do know now is that Theresa May has become the latest in a line of Tory prime ministers whose time in office has been consumed by anguish over Europe and ultimately, brought to an early end.